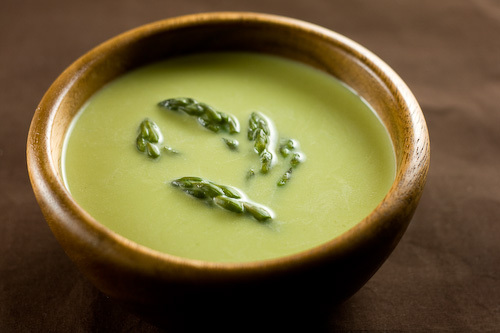 A fresh and easy asparagus soup in a base of chicken broth, cream, and onion, seasoned with thyme and dry vermouth. Trim asparagus to remove the tough ends of the stalk and steam until soft. Puree asparagus with broth and spices in a blender or food processor. Heat soup in a saucepan and enjoy. You can replace dried spices with 1-2 teaspoons of Old Bay seasoning if you wish.